Home Sea Coast Raptors Inch Lake Wildlife Habitat Views & News Contact Us. 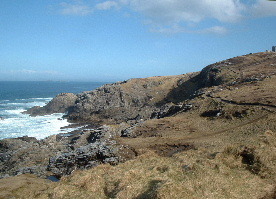 Malin Head is the most northerly point of the Irish mainland but to the North East lies the small island of Inishtrahull. This island has the oldest rocks in Ireland and is closer in rock type to Greenland. A small community of fishermen and their families lived here until the early 1900's and a manned Lighthouse only became automatic over twenty years ago. Now the island is left to the birds and the Grey Seals that breed on nearby rocky islets. Eider Duck nest among the gravestones on Inishtrahull and are common around the rocky coast of Malin Head. In the Summer you will see the large white seabird with black wing tips, the Gannet making spectacular dives for fish from a height of 30 meters or more. These birds come to feed from their nearest nesting colonies in the western isles of Scotland and will later regurgitate the fish to feed their young. Malin Head is a good point to look out for migrating seabirds in Autumn and Spring. Manx Shearwaters pass in large numbers in Autumn to spend the winter off the coast of South America. Birds that nest on the cliffs of North Inishowen include the Shag, Guillemot, Fulmer and Kittiwake. The Fulmer looks like a seagull but is related to the Albatross which can be seen in its stiff wing flight. Fulmars were rare in Ireland but is thought to have benefited from the waste products of the fishing industry. An easy place to see Fulmars nesting is beside the car park at Dunree Fort Military Museum ( where is also a small museum showing the wildlife of the peninsula). They can also be seen at Culdaff and at Malin Head. Rock Doves which are wild ancestors of city pigeons nest on ledges of sea caves. The Chough is a rare bird of the crow family slender red bill and red legs. Another bird seen around the coastline is the Oystercatcher. These black and white birds with long red bills and legs have a distinctive "peep peep" call. A similar looking but much smaller winter visitor is the Turnstone which gets its name from its habit of turning over small stones in its search for small shellfish. Another small black and white bird is the Ringed Plover which is almost invisible among the beach shingle and pebbles until it does it's distinctive burst of running, and when you move closer they then fly away in a flock. There are plenty of other creatures of interest on the coast in addition to birds. The twice daily withdrawal of the sea reveals a large community of animals, especially on rocky coasts, that live in their particular niche. The most apparent at low tide covering nearly every rock surface are Barnacles. These crustaceans related to shrimps and crabs. If you look closely at the top of the shell is a "trapdoor" which opens when the tide comes in and it's feathery legs extend out to trap drifting plankton. The large conical shaped shellfish among the barnacle are limpets which move around grazing minute plant life from the rocks but always return to the same spot when the tide returns. The snail-like shellfish common the rocky beaches are Winkles of which there are various species at different zones of the beach. Whelks are similar to winkles but with a more pointed shell. These shellfish are carnivores. Among the shells washed up on the beach you will find many with a small neat hole that has been drilled by a whelk. A short time spent looking in a rock pool will reveal a wealth of different creatures. The Hermit crab does not have the hard body shell of other crabs and has to inhabit an empty whelk shell. As it grows larger it has to move house and find a bigger shell each time. Sea Anemones are like bright red plants attached to rocks but are actually animals related to jellyfish and capture small creatures with their stinging tentacles. Many of the shells found on the beach such as Razor Shell, Cockle, Tellins and Sand Gaspers spend there lives submerged in the sand with only their siphons protruding above to extract food particles from the water. From time to time some unusual animals are washed up on the beaches of Inishowen. In the last few years two species of the rare sea turtle Kemp's Ridley have been found at Ballyliffin and Dunree beaches. This turtle only breeds in a small area of the Gulf of Mexico and there only a few thousand of them left. A few Leatherback Turtles have also turned up. The leatherback turtle is the largest in the world, and grow to about 2 metres long. A Sperm Whale is among the sea mammals periodically beached, and in the1970's a Killer Whale swam right up the Foyle to the centre of Derry City.